We, D. K. and Choity Sarkar, have two stories to share with you. Pompa Acherya was a Hindu married woman and her husband was also a Hindu. She had a seven-year-old son and her family condition was not stable. Pompa worked hard for her family. 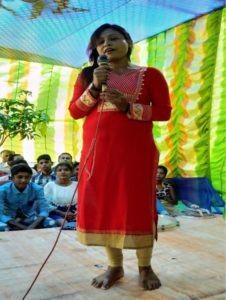 She would come to our Kestopur fellowship where Brother Sanjoy Roy was the leader. There, she heard about Jesus and decided to take a public testimony of baptism. I asked her, “If you take public testimony of baptism, will your husband accept that?” She replied, “It is my personal decision. I already talked with my husband and he has no objection.” Praise God for the decision that she made! On August 4, 2018 she took a public testimony of baptism. After her public testimony of baptism, Pompa attended our annual camp at Murshidabad and she received many blessings there. She became on fire for the Lord. But when she came back, she received shocking news. Her job had been taken away from her. However, she did not lose the hope. She continually attended the church service in Kolkata and we prayed for her. Last Sunday, we received good news. Pompa thanked God during church that she had found a new job at a new company. Then, we all thanked God together for this good news! Kazem Shake was from a Muslim background and his family was conservative Muslims. In his old age, he met Jesus in one of our meetings and accepted him as his Lord and Savior. His family was not happy, but Kazem was strong with his decision and he took water baptism on November 6, 2018. His acceptance did not make any change in his family, but it did make some change in the society. After the annual camp, a bridge was made among the church and village people. 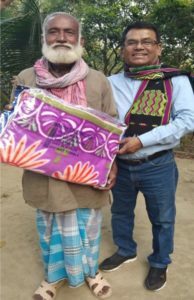 Kazem’s conversion and distribution of blankets to the poor non-Christians of the village made some change among the village people and leaders. We hope and pray for betterment. The church needs prayer and support.